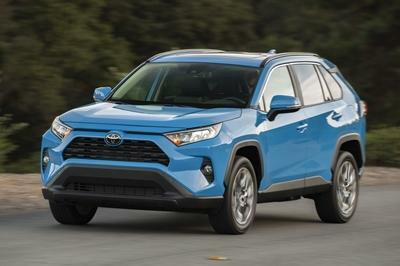 To keep it looking funky fresh for its fifth generation changeover, the Toyota RAV4 received all-new styling front to back, giving it a much more “truck-like” appearance overall. 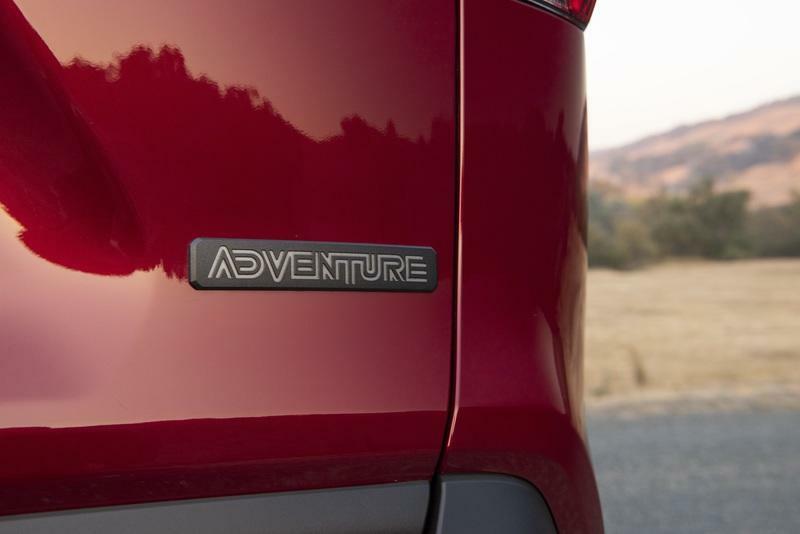 This is particularly evident in the front fascia, where we find the Adventure grade offers a unique grille that takes cues from Toyota’s truck lineup, specifically the Tacoma. On either side of the reshaped primary intake, you’ll find Multi-LED headlights as standard, plus features like Automatic High Beams and an automatic off/on feature. LED daytime running lights are standard as well. 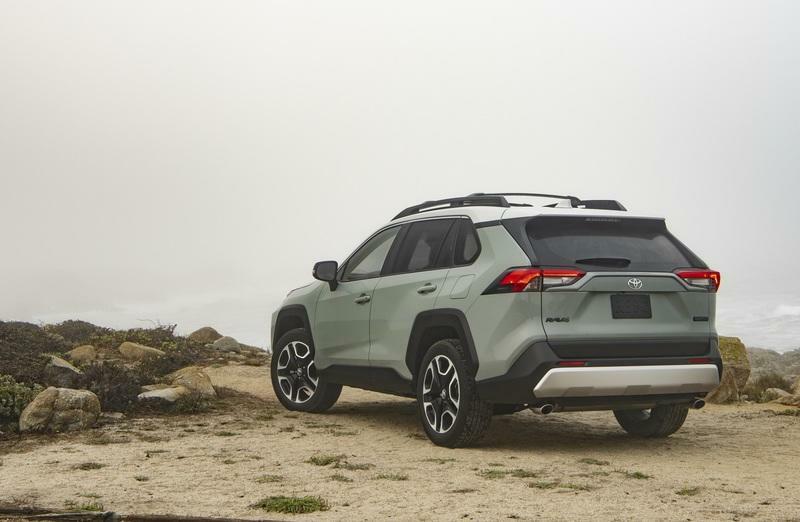 In the corners, the RAV4 Adventure comes with 19-inch split five-spoke wheels as standard, with matte-black accents to offset the style. 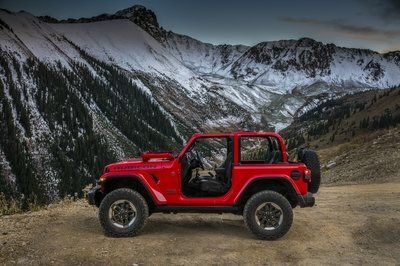 There’s also optional heated sideview mirrors, while up top, you’ll find a set of roof rails that are unique to the Adventure grade, plus the option for enhanced practicality thanks to roof rack cross bars. 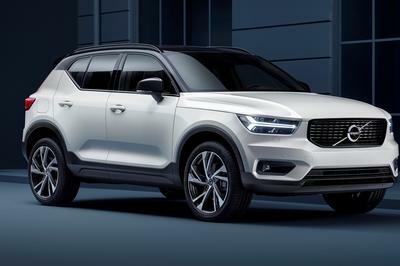 To finish it off, the Adventure grade is offered with a selection of unique exterior colors and an optional Ice Edge-colored roof for a little two-toned styling. The exterior dimensions are new for 2019 as well, and measure in at 105.9 inches for the wheelbase, 181.5 inches for the overall length, 73.4 inches for the overall width, and 68.6 inches for the overall height. 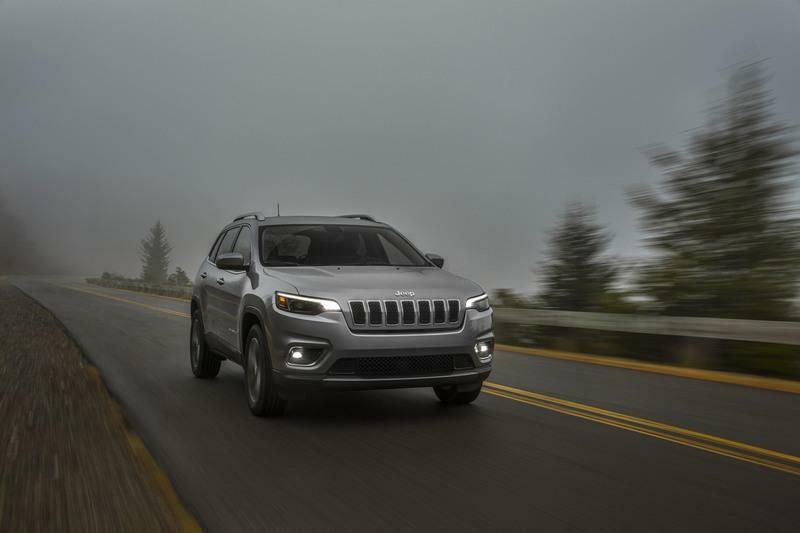 Already in its fifth generation as of the release of the 2014 model year, Jeep is keeping the 2019 Cherokee looking modern with a new look, including a new front fascia and a new hood. 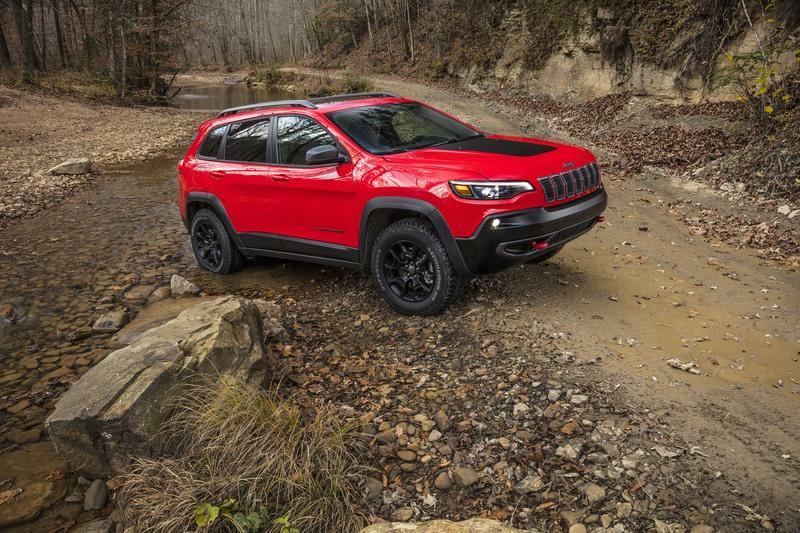 While definitely taut and streamlined compared to Cherokee models of the past, the latest iteration keeps several of the classic cues you’d expect - for example, the signature seven-slot grille is still in place. 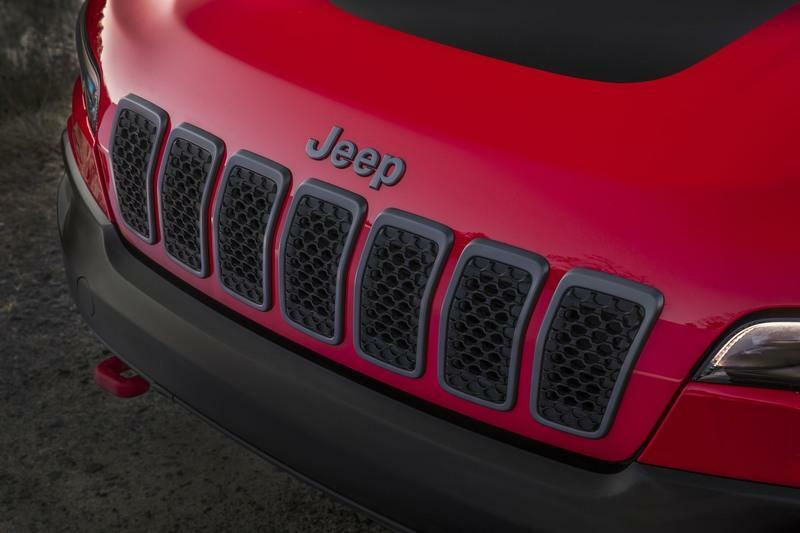 On either side of the grille, the Cherokee comes with slim LED headlights, while LED’s are used for the taillights as well. New daytime running lights and fog lights arrive for the 2019 model year, while unique details help to differentiate between the various grades, such as chrome tow hooks for the Overland models and red tow hooks for the Trailhawk models. 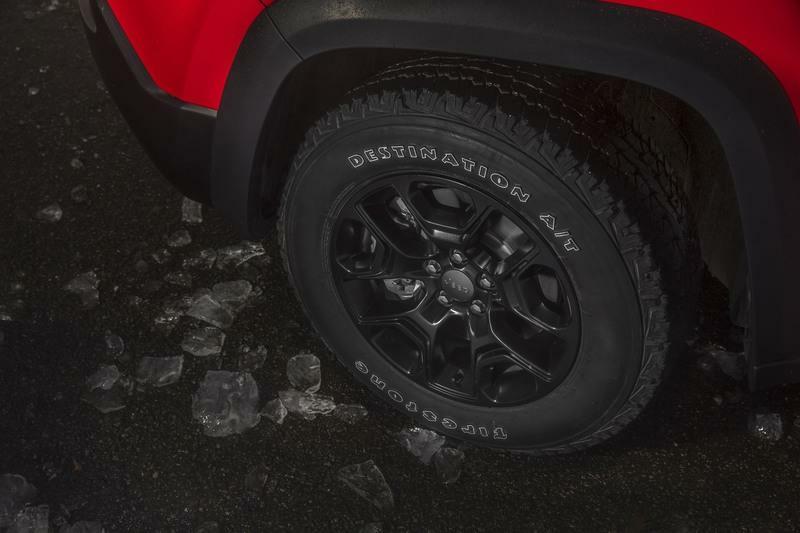 Further updates include new wheel designs, with sizable 19-inch rollers on Overland models and 17-inch wheels on Trailhawk models. 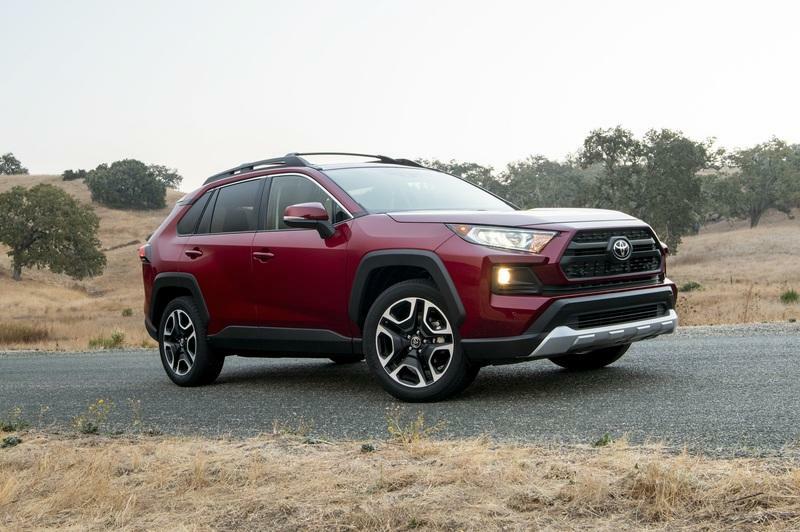 The exterior dimensions are a bit larger than those of the RAV4, measuring in at 107.1 inches for the wheelbase, and 182 inches for the overall length. However, the overall width and height are slightly smaller than the Toyota, measured at 73.2 inches and 65.7 inches, respectively. 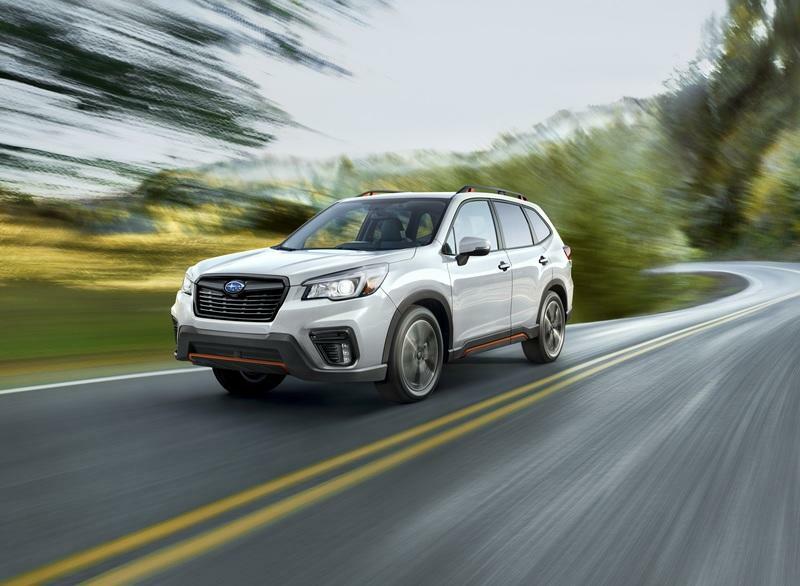 Like the RAV4, the Subaru Forester also enters its fifth generation for the 2019 model year, and it too comes with new styling to go with the generational update. The look is classic SUV, and includes exterior features like LED headlights as standard. 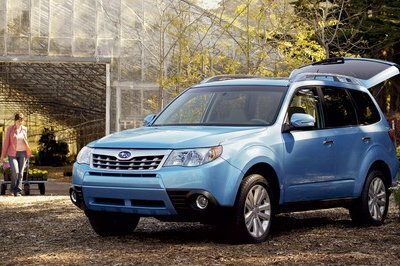 Higher in the range, the Forester comes with standard features like LED fog lights and High Beam Assist. A slew of unique trim bits were added to help differentiate between the various grades, while every model gets lower body cladding to protect the paint from wayward bits of trail. Roof rails are also standard on all grades except the base model. The optional heated side view mirrors and windshield wiper de-icer help out in colder climates. 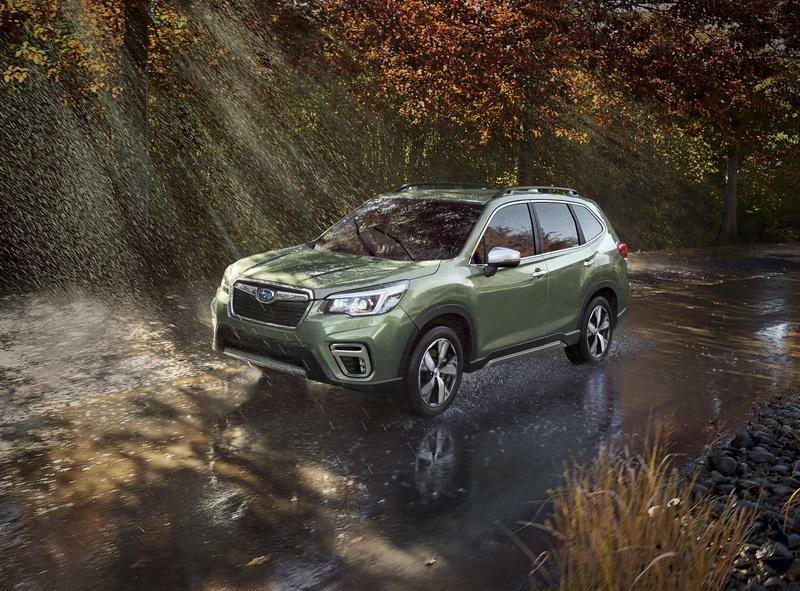 Under the fenders, the Forester comes with either 17-inch steel wheels for entry-level models, or 17-inch alloys and 18-inch alloys higher in the range. 182.1 inches, overall width is 71.5 inches, and overall height is 68.1 inches. 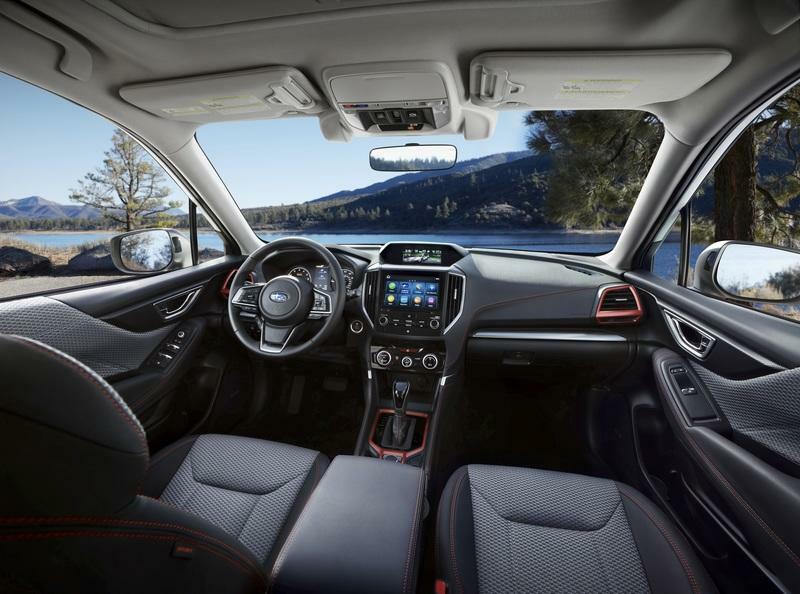 To go with the new looks outside, the 2019 RAV4 gets new looks inside as well thanks to an updated cabin layout. Seating capacity remains set at five, while passengers will enjoy a quieter ride and more space than the outgoing model. The Adventure model comes decked out in Softex leatherette upholstery, plus unique orange accents to add extra spice to the formula. Standard spec tosses in an 8-way power adjustable driver’s seat. Available options include a power tilt/slide moonroof, heated and ventilated seats up front, and a heated steering wheel wrapped in leather. 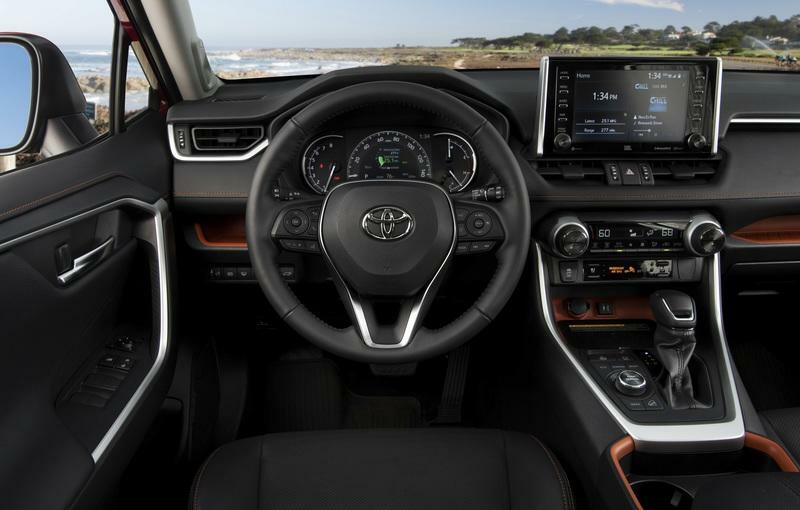 On the infotainment front, the RAV4 Adventure comes equipped with a 7.0-inch digital Multi-Information Display, as well as Entune 3.0 Audio Plus as standard, and an optional JBL stereo. There’s also optional Qi wireless smartphone charging, and an integrated backup camera with dynamic gridlines as standard. Safety is a major focus for the 2019 RAV4, with all models coming equipped with Toyota Safety Sense 2.0 as standard. This suite of tech includes systems like Pre-Collision with Pedestrian Detection, Lane Departure Alert with Steering Assist, Full-Speed Range Dynamic Radar Cruise Control, Road Sign Assist, and Lane Tracing Assist. 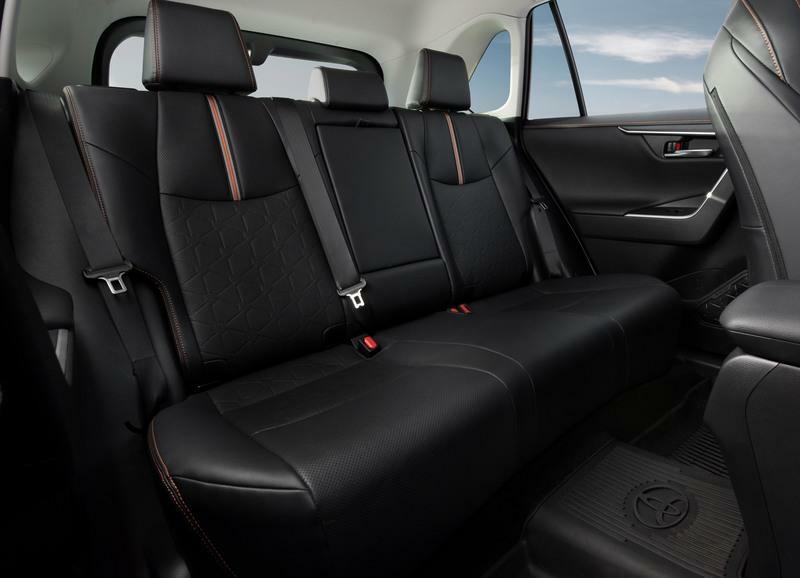 As for practicality, the RAV4 gets a height-adjustable power liftgate, 60/40 split rear bench, and 37.6 cubic feet of cargo room behind the second row. The Cherokee also gets a new interior design for the 2019 model year, plus new interior color schemes as well. 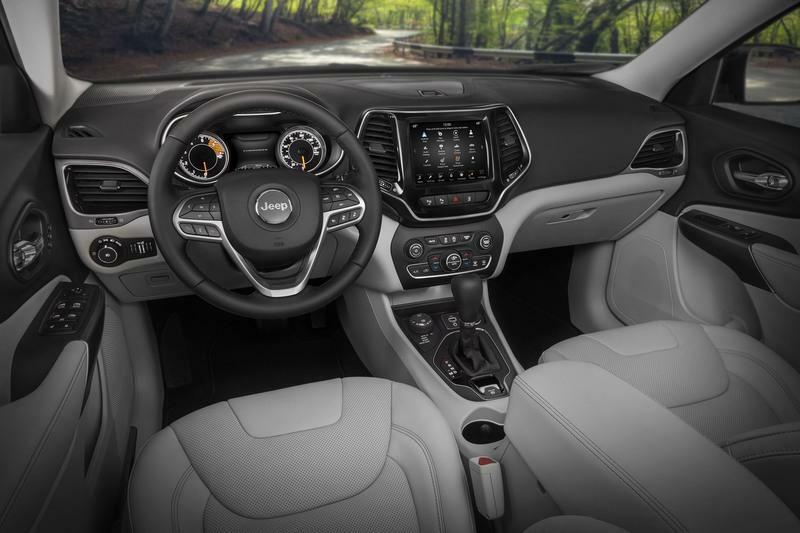 Inside the cabin, you’ll find high-end trim bits like Satin Chrome and Piano Black high-gloss accents, while cloth upholstery comes as standard with Nappa leather offered as an available option. Further options include a leather-wrapped steering wheel with a heating function, as well as heating and ventilation for the front seats and a large dual-pane sunroof. Handling the infotainment is the latest Uconnect system with complimentary Apple CarPlay and Android Auto support. Touchscreen sizing ranges up to 8.4 inches in diameter, with a 7.0-inch screen as standard. USB ports and a 115-volt outlet round it out. Onboard safety tech includes features like LaneSense Lane Departure Warning plus Lane Keep Assist. The Cherokee also comes with ParkSense Parallel/Perpendicular Park Assist, plus such standards as Adaptive Cruise Control-Plus, Forward Collision Warning-Plus, LaneSense Lane Departure Warning-Plus, and Blind-spot Monitoring. This year, the Cherokee comes with more rear cargo room than the outgoing model, with a maximum of 27 cubic feet offered behind the rear bench. Making the most of it is a hands-free power liftgate made from a composite material, as well as a 60/40 split for the rear bench. 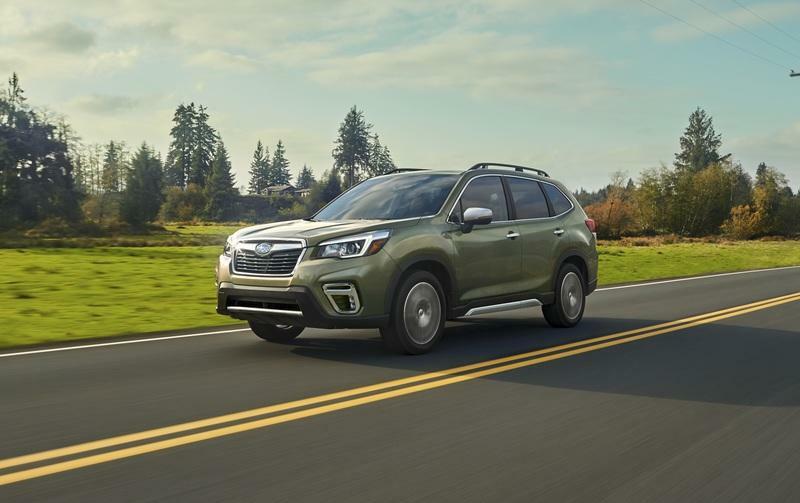 With the most-recent generation changeover, the 2019 Subaru Forster offers a more spacious interior as well as a quieter ride and reduced NVH overall. Once again, unique trim bits are used to differentiate models higher in the range. 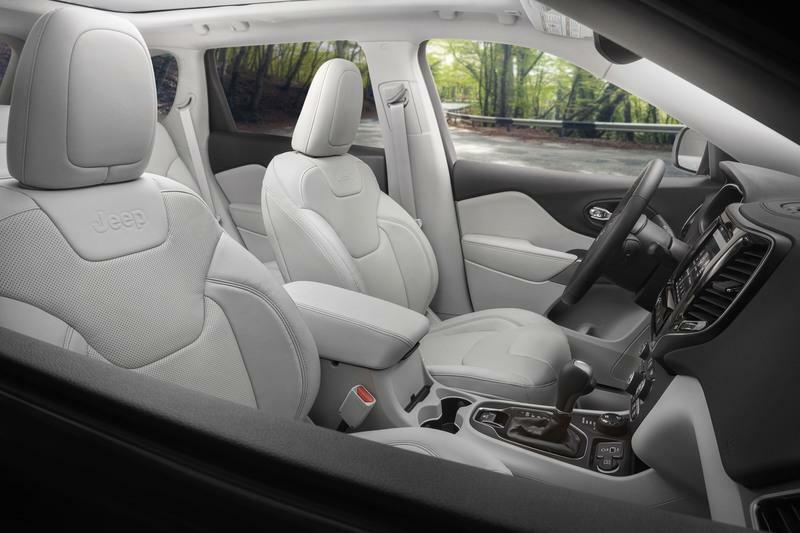 Heated front seats are optional, as are heated rear seats and a heated steering wheel. Standard spec includes automatic climate control with dual-zone climate control offered higher in the range. You’ll also find goodies like a Remote Engine Start feature and eight-way power adjustable front seats. Subaru’s EyeSight Driver Assist Technology suite is standard. Step up to the Touring grade, and you’ll get Subaru’s DriverFocus system, which can detect when the driver is distracted or fatigued thanks to the implementation of facial recognition software, which is also used to store custom settings for the multifunction display, sideview mirror position, and climate control for up to five individual drivers. Further notable safety features include Pre-Collision Braking, Adaptive Cruise Control, Lane Departure Sway Warning, Lane Keep Assist, and High Beam Assist. And when it comes to hauling stuff, the Forester comes with as much as 35.42 cubic feet of space behind the rear bench. If you’re serious about taking your crossover off the beaten path, then this is definitely the most important section to consider. 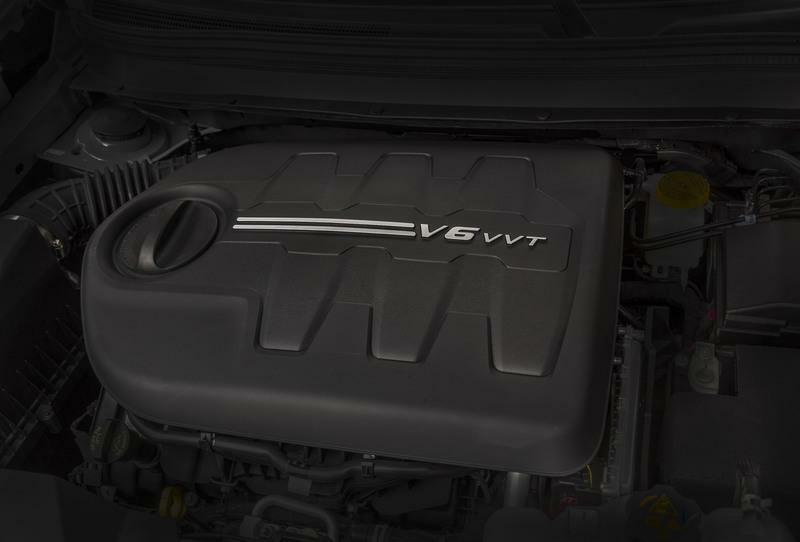 Under the hood of the 2019 RAV4, you’ll find a 2.5-liter naturally aspirated four-cylinder engine. Peak output is rated at 203 horsepower at 6,600 rpm and 184 pound-feet at 5,000 rpm, with fuel returns come to 24 mpg city, 32 mpg highway, and 27 mpg combined. The four-cylinder mates with a Direct Shift-8AT automatic transmission featuring torque converter lock-up in the second through eighth gears. Acceleration takes 8.2 seconds to hit 60 mph, while maximum towing capacity is set at 3,500 pounds. The 2019 RAV4 also offers a hybrid model if you want to go green (and get a healthy dollop of low-end torque in the process), but unfortunately, the Adventure grade is only available with the gas-only powertrain. Sending the Adventure grade’s power to the pavement is a Dynamic Torque Vectoring All Wheel Drive system, which is a first for the model. This system can deactivate torque to the rear axle for additional mpg when all-wheel traction isn’t needed. However, when traction drops, the system can alternatively send up to half of the available torque to the rear axle as necessary, and independently dole out torque between the right and left wheels, as well. The AWD system also offers specific terrain modes (such as Sand, Mud, or Rocks,), which are selectable via a rotary knob in the central tunnel. The setup includes a nifty information readout in the gauge cluster that tells you exactly how much torque is going to each corner while on the move. Further off-roading features include Downhill Assist Control, which will hold the vehicle at a given speed after lifting off the throttle, making it easier to concentrate on your line and stay out of ruts. The Adventure grades also come with standard Trailer-Sway Control, Hill Start Assist Control, and Downhill Assist Control. 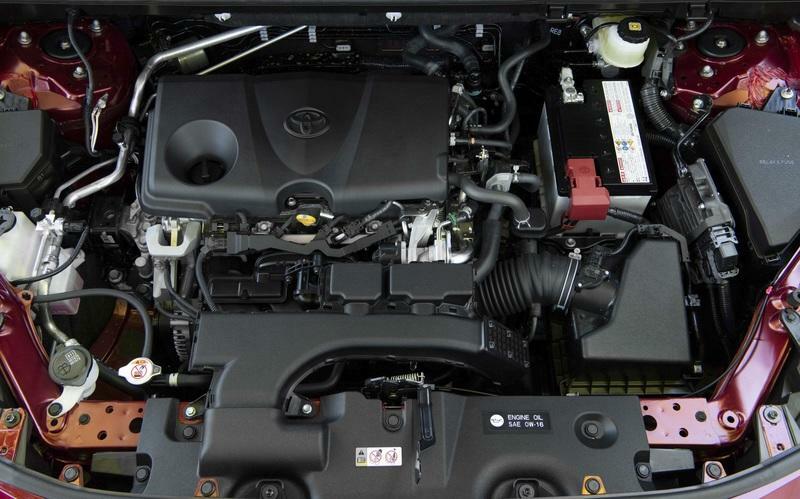 Under the skin, the RAV4 includes the latest Toyota New Global Architecture (TNGA-K) platform. The suspension set-up includes MacPherson struts in front and a multi-link in the rear, while the tires are sized at 235/55R19. Curb weight tips the scales at a healthy 3,615 pounds. 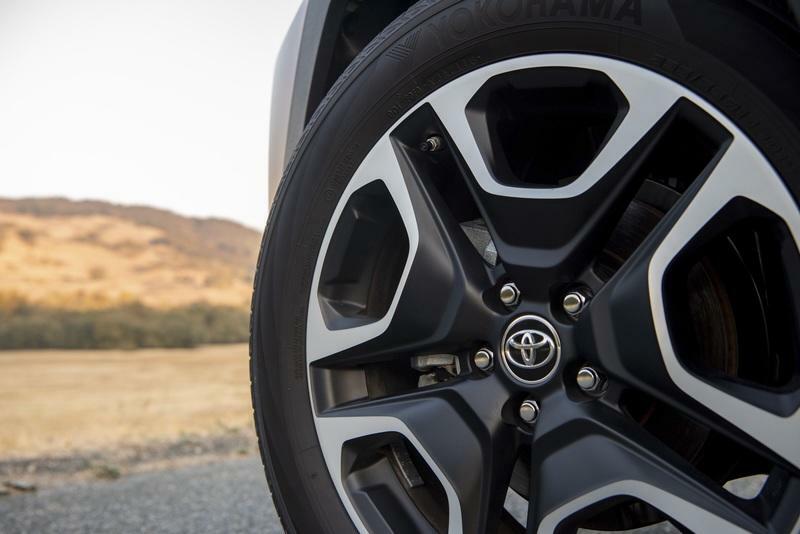 The RAV4 also comes with more ground clearance for the 2016 model, with 8.6 inches offered on the Adventure grade. This, combined with shorter overhangs, helps it to achieve 19 degrees for the approach angle and 21 degrees for the departure angle. Kicking off the engine spec for the 2019 Jeep Cherokee is a turbocharged 2.0-liter four-cylinder producing 270 horsepower 295 pound-feet of torque. Alternatively, you can also get a 3.2-liter Pentastar V-6 producing 271 horsepower and 239 pound-feet of torque, which ups towing capacity to 4,500 pounds. 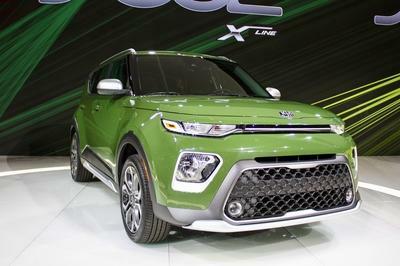 The most fuel-efficient of the bunch is a 2.4-liter powerplant making 180 horsepower and 170 pound-feet of torque, which in 4x4 trim returns 21 mpg in the city and 29 mpg on the highway. Each engine connects to a nine-speed automatic transmission. 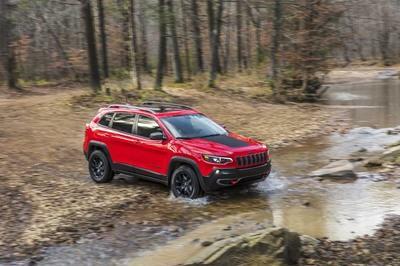 The 2019 Cherokee also comes with a fresh lineup of 4WD systems, including something called Jeep Active Drive 1 with a rear drive module and lower overall weight. Then there’s the Jeep Active II setup with a two-speed Power Transfer Unit and low-range gear reduction, which also pairs with an extra inch of ride height for the suspension. Finally, there’s the Jeep Active Drive Lock with two-speed Power Transfer Unit, low-range, and mechanically locking rear differential. Jeep is also including a rear-axle disconnect feature for better overall mileage. Keeping the traction where its needed is Jeep’s Selec-Terrain system, which offers a selection of modes for variable terrain and conditions, such as Snow, Sport, Sand/Mud, and Rock. The system also comes with features like Hill-ascent and Hill-descent Control. A 51.2:1 crawl ratio makes for even more off-road worthiness, while the independent front and rear suspension provides just the right ride for the occasion. The Cherokee also comes with 8.7 inches of ground clearance, while the approach and departure angles are rated at an impressive 29.9 degrees and 32.2 degree, respectively. What’s more, the Trailhawk models offers real steel skid plates, which are a unique offering in this particular comparison. As for the Subaru, motivation is derived from a naturally aspirated 2.5-liter four-cylinder “boxer” style engine across the range. Output is rated at 182 horsepower at 5,800 rpm and 176 pound-feet of torque at 4,400 rpm. Fuel returns are rated at 26 mpg in the city and 33 mpg on the highway. Making the connection is a Lineartronic CVT, which is programmed to simulate the step-down gear changes of a seven-speed manual transmission. There’s also a standard driver-selectable SI-Drive for customizable drive modes, including “Sport” and “Intelligent”. 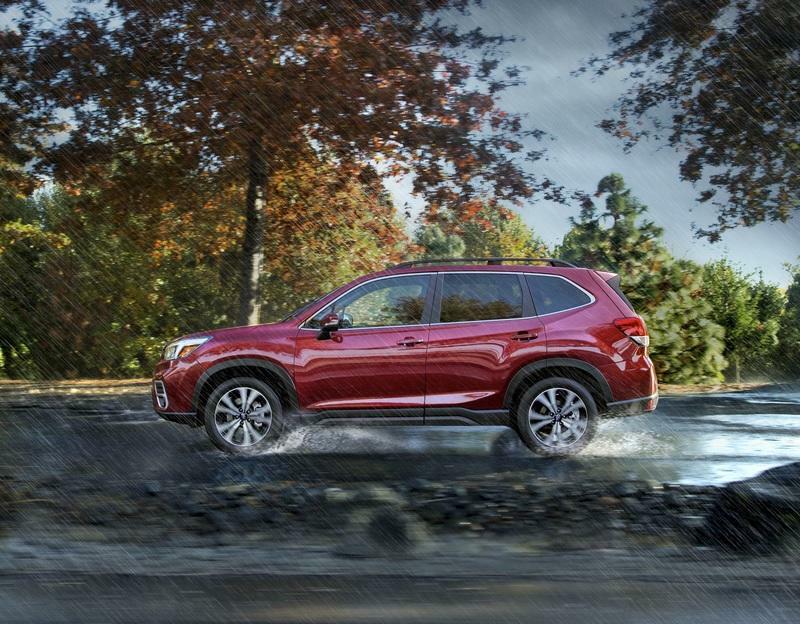 Making the traction is Subaru’s classic Symmetrical AWD system. A Trailer Stability Assist system is standard, as is an Active Torque Vectoring. Higher trims also include drive modes specific to snow and mud, and features like X-Mode with Hill Descent Control. Subaru’s Global Platform provides the underlying structure, while a fully independent suspension system keeps it shiny side up. A stout 8.7 inches of ground clearance keeps the vital bits above immovable objects. There’s also 22.9 degrees for the approach angle and 24.6 degrees for the departure angle. Finally, the Subaru Forester comes equipped with body “underguards” as standard, which basically amount to reinforced plastic, rather than the metal guards found in the Jeep Cherokee Trailhawk. Pricing for the 2019 Toyota RAV4 Adventure grade starts at $32,900, making it one of the more expensive models in the RAV4 lineup. However, it should be noted that the Adventure grade also includes loads of standard features that lower trim levels do not, which is important when weighing this model against the competition listed in this comparison. Jeep offers the Cherokee in five unique grade levels including the Latitude, Latitude Plus, Limited, Trailhawk, and finally, the top-spec Overland. Pricing starts at $25,240 for the Latitude, followed by the Latitude Plus at $26,895, the Limited for $30,750, the Trailhawk for $33,695, and the Overland for $36,495. 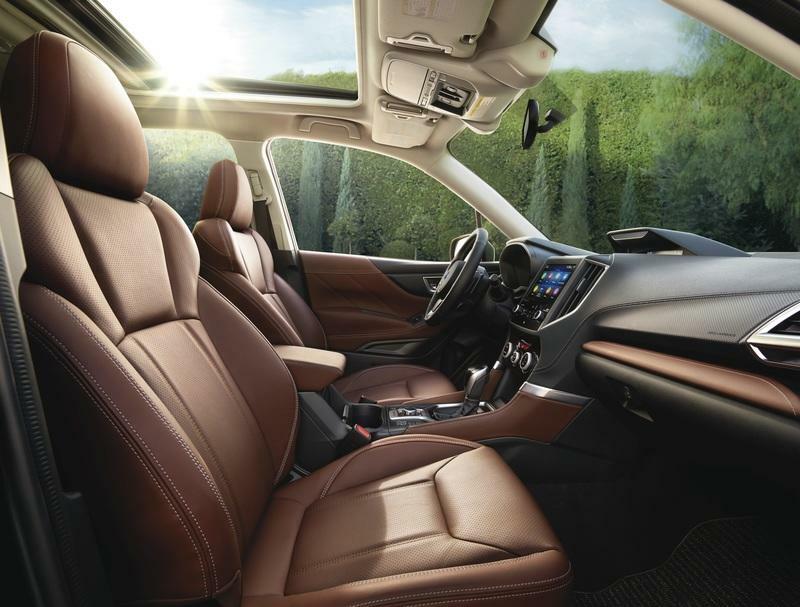 Subaru offers the Forester in five grade levels, including the standard trim, Premium, Sport, Limited, and Touring. 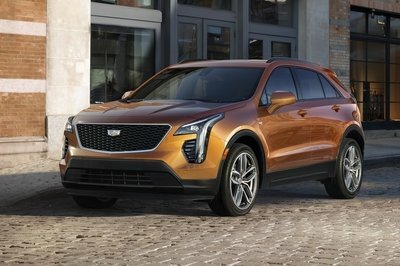 Pricing starts at $24,295 for the standard model, $26,695 for the Premium, $28,795 for the Sport, $30,795 for the Limited, and $34,295 for the top-trim Touring model. If it’s off-road performance you care about the most, then the Jeep is the most obvious pick, with the Trailhawk standing head and shoulders above the others. Its combination of purpose-built gear, like the 51.2:1 crawl ratio and metal skid plates, as well as its impressive approach/departure angle and Jeep’s reputation for off-roading, all combine to create one very stout package. No doubt, this is the winner in the rough stuff. That said, the Toyota and Subaru both offer their own perks. The RAV4 finds a nice middle ground between off-roader and street prowler, and will definitely hold its own on a variety of surfaces and trails, especially when decked out in the full Adventure Grade trim. Meanwhile, the Forester looks like a solid choice if you’re more concerned about road manners than you are about outright capability or muscle-bound performance, and it’s got the right specs to hang in the dirt every so often. The question is - which would you rather have? Read our full driven review of the 2019 Toyota RAV4. 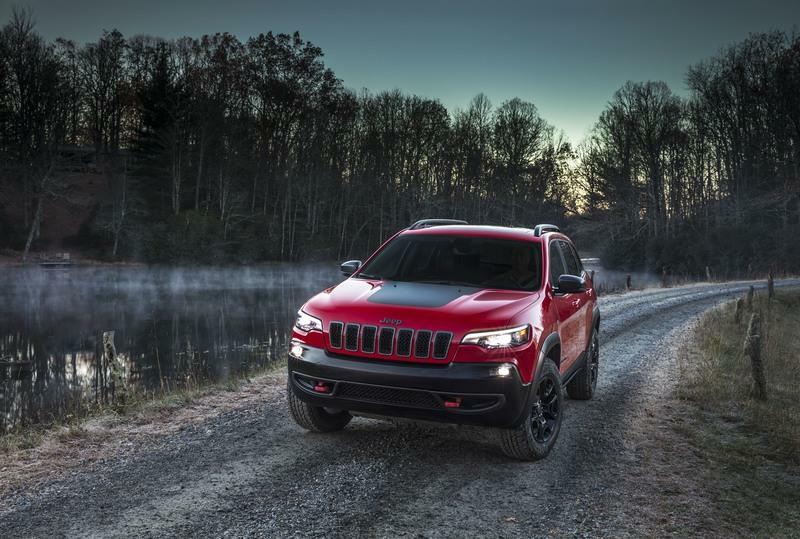 Read our full review of the 2019 Jeep Cherokee. 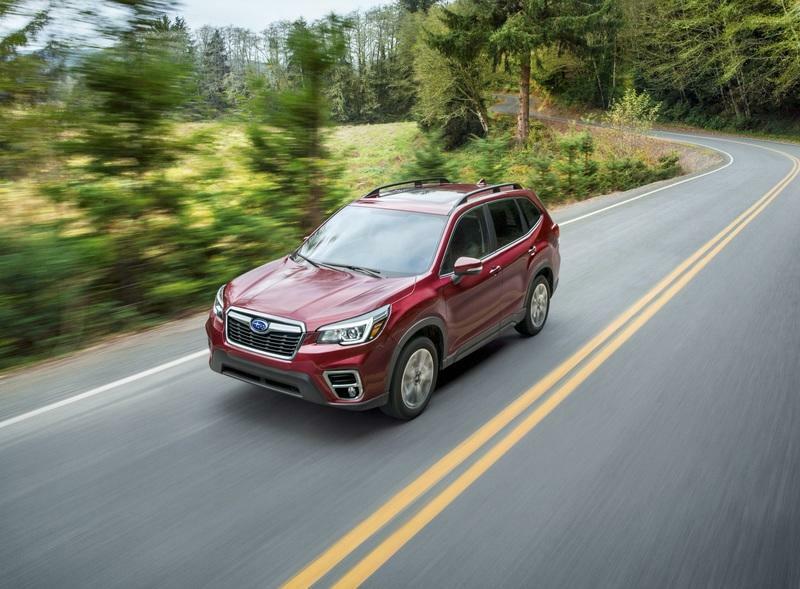 Read our full, driven review of the 2019 Subaru Forester.